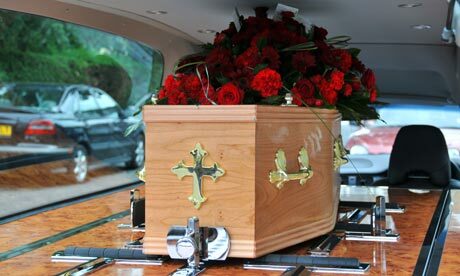 The basic cost of a funeral has risen for the ninth consecutive year, according to an annual survey which reveals the key expenses associated with dying have shot up by 71% since 2004. Hard-up families are increasingly turning to credit cards and even bank loans in order to fund the cremation or burial of their loved ones, and may even be missing out on financial help because of confusion around available benefits, the Cost of Dying Report warns. Produced by insurer Sun Life Direct, it shows that the basic costs of a funeral have risen to £3,284 from £3,091 in 2011, a 6.2% rise. Burial costs accounted for the largest single increase, rising by 9.6%, while cremation costs rose by 6.6% and funeral directors' expenses by 5.3%. The total cost of dying, including things such as probate, headstones and flowers in addition to the basic cost of a funeral, has decreased slightly by 1.9% from £7,248 in 2011 to £7,114, primarily driven by shrinking estate administration costs which could be reflective of increased price competition and consumer awareness. The report reveals the extent to which a death can leave families in severe financial straits. About 17% of respondents to a related survey said they had struggled with funeral costs, with 20% putting the outstanding balance on a credit card, 10% borrowing money from a loan provider, and 9% having to sell their belongings. The government's support system, the Social Fund Funeral Payment Scheme, designed to contribute to the cost of funerals for the most vulnerable in society, is also struggling to meet mounting demand. The findings come amid growing awareness that consumers do not have to use funeral directors or be forced to accept the unwanted trappings of traditional send-offs, and can make arrangements themselves or resort to "greener" options. The second Joy of Death festival held earlier this month in Bournemouth provided a showcase of eco-friendly coffins and shrouds, and offered a pointer towards the role of technology such as webcast funerals, celebrations via Skype, digital memorials and phone-scannable data on gravestones. Simon Cox, head of life planning at Sun Life Direct, said: "Debt, despair and distress are common hallmarks of arranging a funeral, and there is no light at the end of the tunnel to suggest funerals will become more affordable. "Moreover, a difficult economic climate and increasing demand on public services make further state support unlikely. The vulnerable are too poor to die and we cannot let this situation continue." Dr Kate Woodthorpe, a lecturer in sociology at the University of Bath, said: "National debate on social care in old age is focusing on the role of the individual in financial provision, and the matter of funeral cover should not be left out of this conversation. "The number of deaths each year is expected to rise by 17% over the next 15 years and the issue of funeral affordability deserves urgent attention if we are to give our loved-ones the send-off they deserve."